A masculine card for my nephew. In this case, it’s my nephew’s birthday today. He’s 23 years old now. Makes me feel old! I used my Hero Arts Envelope Line wood stamp to create the background on the card, using Distress Ink in Forest Moss on Neenah Desert Storm card stock. I used that same stamp to create the center focal panel on off-white card stock, using Distress Ink in Spiced Marmalade for subtle texture. I borrowed the idea for the paper-pieced cupcake from the Watercooler Love blog. I stamped the cupcake stamp three more times on white card stock to which I had applied three shades of Distress Paints in Vintage Photo, Peeled Paint and Mustard Seed. I had dried the paint swatches with my heat tool and used Staz On ink in brown to stamp the image. Then I cut out the individual pieces, with the green for the cupcake wrapper and candle, the brown for the chocolate icing and the yellow for the candle flame. I pasted these over the original cupcake image, using foam tape for dimension. The final touch was to wrap a piece of brown embroidery twine around the center panel. What do you think? Is it masculine enough? I think my nephew will like it. Thanks for looking! In this third assignment from the Online Card Classes His and Hers segment, we focused on sympathy cards. I chose to work with the same colors but different imagery and fonts to appeal to different genders. 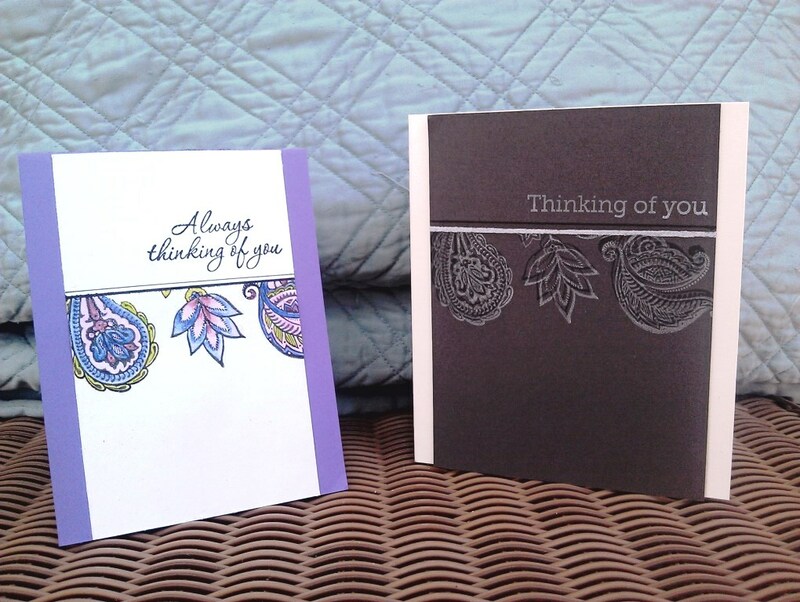 Simple sympathy cards for both genders. Although these look like simple cards, it took me several tries to get them right! That’s the challenge with simple cards that rely only on stamps – it’s easy to make an error with getting a stamp positioned correctly or smudging the ink. I started with the masculine card. The class example used a really cool herringbone stamp, but I couldn’t find anything that read both masculine and neutral enough for a sympathy card. You don’t want to be cutesy when it comes to expressing your condolences. So I went with a leaf stamp that had enough length to it to use it sideways. Once again, I went with an ivory card base (next time I will have to create a masculine card using a white base!). I used two shades of ink, VersaMagic Spanish Olive and Hero Arts Shadow Ink in Butter Bar, to stamp the leaves in a staggered pattern. I used large sticky notes to tape off the edge and my Eclipse masking sheet to mask the green leaf so that it appeared that the yellow one was behind it. I also purposely left a little green ink on the stamp so some of it showed through the yellow. I used Versafine Vintage Sepia to stamp the sentiment and the vertical border. The sentiment is from my old stand-by, Hero Arts Everyday Sayings, and the border is from Simon Says Stamp Happy Every Day. I used foam adhesive to adhere the layer on the ivory card base. For the feminine version, I used the same inks, but this time with a flower stamp from Impression Obsession, G5561. The image comes as one stamp, so I carefully inked it up used both inks, with a little overlap at the base of the yellow flower. Although the green flower didn’t stamp evenly, I decided to leave it as I think it adds to the imagery of the flowers being in the sun. That, and I didn’t want to start over again! The thin double border came from the same stamp set as above, while the cursive sentiment comes from Stampendous’ Orchid Greetings set. This time I used white card stock, adhering the white layer with foam squares on a white card base. 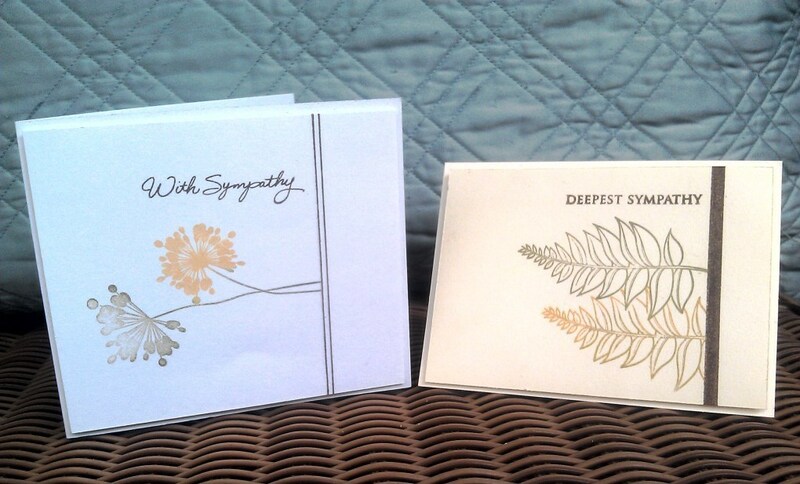 Both are very simple, but I think that’s best when it comes to sympathy cards. In this second assignment from Online Card Classes: His and Hers, we focused on creating birthday cards with masculine and feminine twists. I loved all the examples from class, but I especially loved the clean and simple look of working with strips of colored vellum. Bright colors for my girly card, and natural colors for my manly card. My “Her” card followed the class assignment pretty closely. I used a white card base and white card stock for the layer, around which I wrapped four thin strips of vellum. Although the instructor used various shades of Copic markers to color her vellum strips, I don’t have any (they are too expensive!). Instead, I used my Tim Holtz Distress Markers in feminine colors of pink and blue. Since they are like watercolor markers, I ended up rubbing each strip with a paper towel right after I colored it to help blend it in. You can still see some streaks, but I am okay with that! I used my Simon Says Stamp die-cut, “Oh Happy Day,” to add the word “Happy” in light blue glittered paper. I tucked it behind the top strip, and then stamped the pink diagonal strip with a birthday stamp from Stampabilities. Then I added iridescent sequins randomly. I loved the instructor’s tip of sticking each sequin on a glue dot and then adhering the glue dot to the paper. Much easier than using wet glue or glue tape! For the “His” card, I used the same technique but with more manly colors. I started with an ivory card base and a layer of tan textured paper. This time I colored the four vellum strips in shades of brown, yellow and green. I used the same birthday stamp on the green vellum. 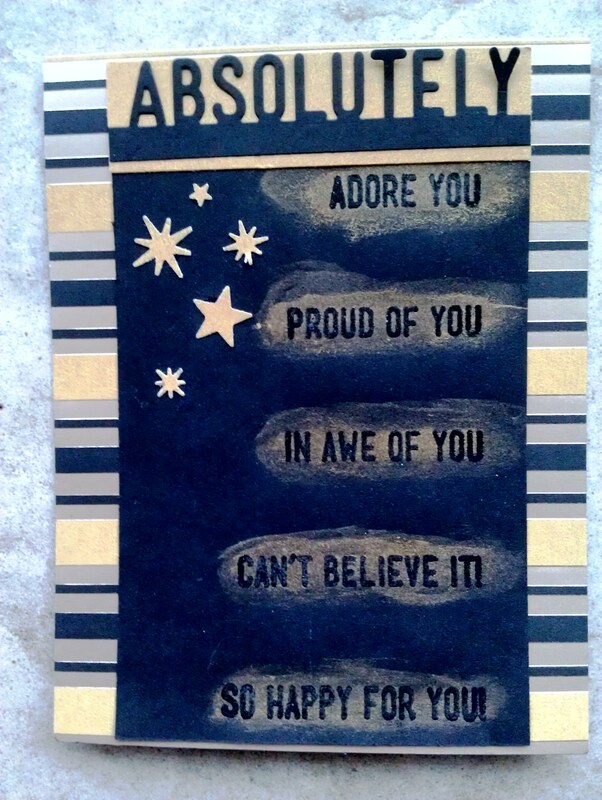 Then I stamped “Happy” above the strips in Versafine Onyx Black using a rustic-looking stamp from a Fiskars set. Instead of sequins, I found some bronze brads in my stash, which I think adds to the outdoorsy feel. By the way, with both cards, I stamped the “birthday” sentiment using StazOn black ink, since I figured that would be better on vellum. 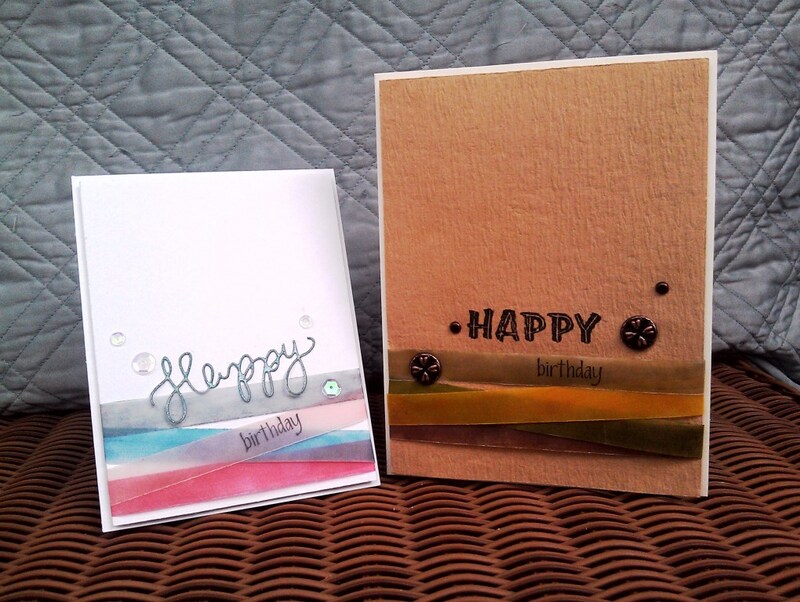 I really like using the vellum strips to custom-color my cards. Please let me know what you think! I’m taking the Online Card Class, His and Hers, which includes techniques to create masculine and feminine cards by changing just a few details. I am loving the class already! For my first assignment, I’ve created a masculine and feminine card using the same image stamps but with different colors and slightly different sentiments. My feminine and masculine (L to R) cards using the same image but different colors. I chose floral stamps that have an exotic, paisley look to them, so I think they work for both males and females. Unfortunately, when I bought this stamp set last year, I unwittingly threw away the outer packaging, so I don’t know the name of this stamp set or the manufacturer. Apologies! Now I know better than to throw those things away! For the feminine card, I worked with shades of purple, pink and a little green. I stamped the images in Versafine Onyx Black and then colored them in with my Derwent Inktense pencils and a water brush. The sentiment comes from the Hero Arts set Good Friends. The masculine card uses the same floral images, but this time stamped in Brilliance Moonlight White, then slightly offset with the same stamp in Versafine Vintage Sepia ink, on dark brown Bazzill cardstock. The more masculine style of sentiment comes from another Hero Arts set, CL582 (sorry, I can’t find a name on the set, but it also has some hearts and stars mixed with the sentiments). The card base is ivory. I also made the the female card smaller and narrower, while the male card is taller and wider. I hadn’t really planned it that way, but I think it reinforces the his and hers theme, don’t you think? It’s interesting to think of images, sentiments, fonts and colors in terms of masculine and feminine. I think most of these can be appreciated by both genders, with just a little finagling. Please let me know what you think. Thanks for looking! It’s always a challenge to create masculine birthday cards. I just bought a 6″ x 6″ Echo Park paper pad called This & That Charming that has a lot of male-inspired imagery and colors. Although cameras are great for both genders, I thought they would be the perfect theme for my brother-in-law’s upcoming birthday. He’s taken some really impressive photos as a hobby. A masculine birthday card. complete with cameras. The idea is that the vellum helps soften a busy pattern while still letting it show through. I really loved the camera paper, so I want to call more attention to that portion of the card. 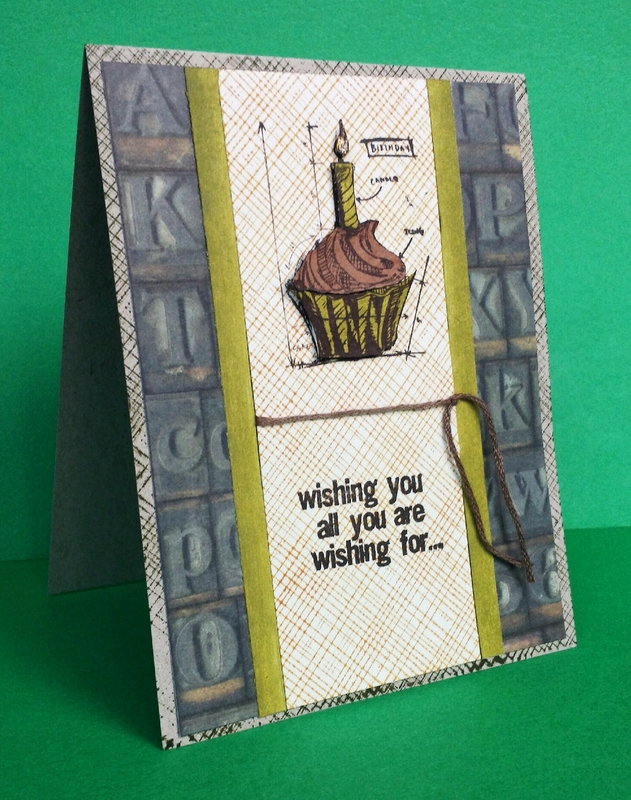 I stamped the A2 card base with my Hero Arts Envelope Pattern stamp in VersaMagic Aloe Vera ink. I layered the patterned papers on a piece of goldenrod textured paper, and I added Washi tape in a yellow arrow pattern at the top and bottom. 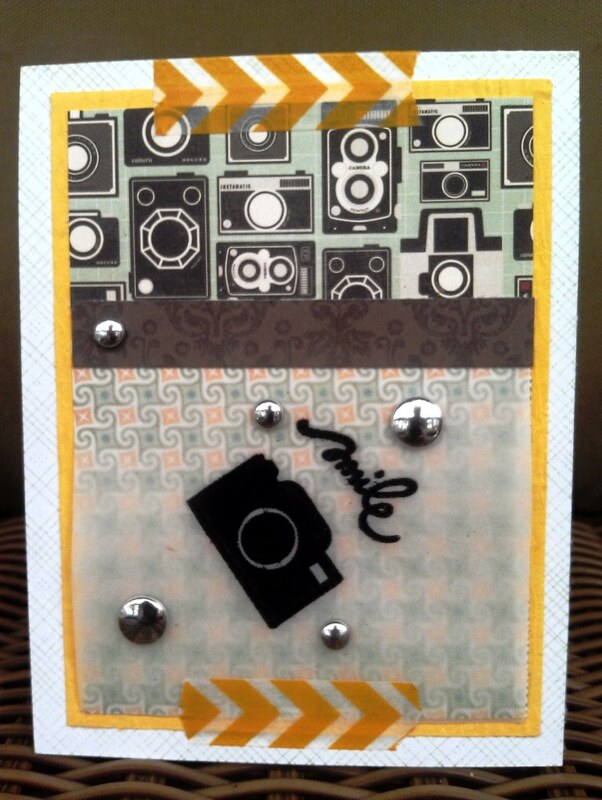 Using Versamark ink and black embossing powder, I embossed the camera (from an older Martha Stewart Bon Voyage stamp set) and the smile sentiment (from a new Heidi Swapp stamp set).Some silver studs added the finishing touch; much more masculine than traditional rhinestone bling, don’t you think? Here’s hoping my brother-in-law will like it. Happy birthday, Jim! Well, this card turned out very different from my original idea! A masculine card for my grown nephew. I have this stamp and die set from Simon Says Stamp with all the sentiments coordinating with the Absolutely die. Originally I had planned to die-cut Absolutely from a piece of white card stock and then print the various sentiments in bright colors down the middle. But when I sat down at my craft table, I decided to go for a more dramatic look with the black paper. I thought I could emboss the sentiments using a champagne-colored Versamark ink pad and have them really stand out against the black background. Well, they didn’t. They were really hard to see. So then I decided to try my Perfect Pearls powder in gold–the first I had ever used Perfect Pearls. It definitely stands out more; I’m just not sure how much I like it. At that point I had to change the background paper to coordinate with the black and gold background. The black patterned paper on kraft paper I had intended just didn’t work. Luckily, I found this 12×12 paper pad from the Paper Studio called Simple Elegance that has a lot of black and gold papers in it. I liked using the stripes horizontally rather than vertically to give it a more modern look. The final touch was punching some stars in gold paper (from the same paper pad) using my Martha Stewart punch. This punch is quickly becoming a favorite! I think I like the final result. It’s darker, more formal and more masculine than I had planned, but I think it will work as a congratulations card for my nephew when he graduates from college.